The imperative to place Rembrandt on a pedestal might have come from Rodin’s idea that art was a quasi-religion and the artist at his best (as Rodin considered Rembrandt to be) was very near a god. Even today, like Rodin we’re quite comfortable compartmentalizing not only personage and period, but artistic medium. Case in point: few people today, when they think of Wordsworth, tend to think of Rembrandt. Perhaps naturally so. One was a poet, the other a painter, and if there’s any misgiving, they were separated by 100 years and at least five times as many miles. For so it seemed, felt by the starry heavens. But history in one of its many lessons informs us that, in spite of the most vehement resistance, ideas, identities, and divisions all merge, distort, and overlap in challenging ways. So, there are two possibilities: either Wordsworth had a disastrous habit amongst acquaintances of theorizing to dizzying heights about Rembrandt and his stumps… or Hazlitt drew on the ready-made image in both cases. The choice might seem obvious, but don’t dismiss the former out of hand. The poet did indeed make noticeable forays into the world of pictures and painters, “professing their genius” on more than one occasion. The reason we don’t often think of Wordsworth in this light has to do in part with a critical reluctance to engage with Wordsworth’s approach to visual art, a reluctance based on a key set of polemical statements made in The Prelude and various correspondences. In these, Wordsworth relates how stodgy and constricting the medium of painting is when compared with the more free-flowing and versatile nature of poetry. Some took that to mean he hated pictures. But in other lines and other letters, Wordsworth assumes a less defensive, occasionally even an effusive, stance when it comes to fine art and what the eye can make of it. While early in life he had associated with many traveling watercolourists and sketch artists venturing north to capture the wild scenery of the Lakes for a public growing more and more interested in seeing the remoter regions of their native England, it was after coming under the patronage of Sir George Beaumont in 1805, a former Tory MP turned dilettante after retirement, that Wordsworth began to wax finely artistic. An immediate obstacle stands in the way of identifying the exact painting referenced here, for the simple reason it’s considerably difficult, to put it mildly, to say with absolute accuracy what Wordsworth actually saw. 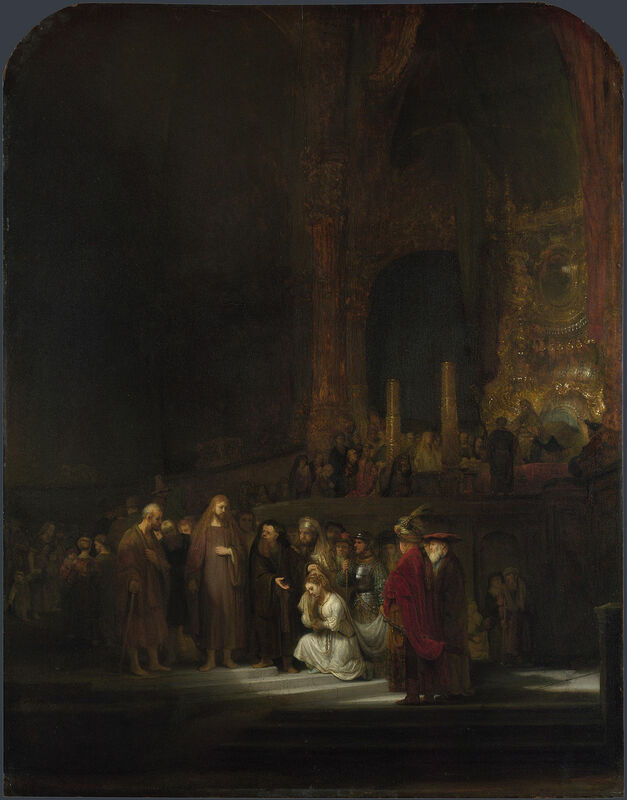 The description of a “light in the depth of the Temple”, though, might indicate the above, The Woman Taken in Adultery, a biblical scene executed by Rembrandt in 1644 and acquired by the National Gallery from the Angerstein collection in 1824. The idea of “feeling” in these lines is key to understanding the importance of the Romantic image that Wordsworth outlines, but plain old seeing does all the work. If we arrive at that restorative inner sanctum of contemplation where images of abbeys (or daffodils) spring up to refresh us, it’s because the eye expended energy in ferrying us there. Certainly, the mind’s eye, the department of the imagination concerned with image, opens the setting. But these “forms” of the land are not simply intuited or recalled in a shallow way, but powerfully and overwhelming envisioned: they “have not been to me/as is a landscape to a blind man’s eye.” The negative is critical here. We cannot say with much precision that Wordsworth simply “imagined” or “remembered” this scene; as certainly as we can say he saw anything, we can only say that he literally saw it without seeing it. The difference between the Wordsworth of ‘Tintern Abbey’ at age 28 and the Wordsworth of Rembrandt at age 38 is that, at least within the upper class circle to which Beaumont’s patronage permitted entrance, art became a topic of greater relevance to the poet and an object, like nature, available for admiration, critique, and inspiration. In a qualified way, then, we can imagine Wordsworth accepting Hazlitt’s characterization of him, however spurious it might have been. But what was it about Rembrandt’s work in the first place that gave rise to this association? If that upcycling characterized some aspect of Wordsworth’s intention for his poetry, here we might ask: what did Rembrandt, on the other hand, envision of his own art? Those two adjectives might convey so obvious a task for a painter as to be a little disheartening. An artist working in the tradition of realism for which the Dutch Golden Age is known would be remiss to paint in a manner anyway short of ‘great and natural.’ Yet the substance for which Rembrandt aimed, “movement” (translated from the Dutch beweegelijkheid, variously connoting mobility or dynamism) reveals a truly Sisyphean task: to express through a medium what in that medium it is impossible to express. If Rembrandt sought to capture the spirited animation of nature, the rustling of leaves or the coy angles of a smile subdued by time, he must have been relentlessly disappointed. Painting may imply motion but it can never produce it; it may recommend and inspire the most sublime ideas, the most gruesome actions, but it will never stage them for all to see. Wordsworth knew this liminal reality intuitively. In painting, we see only a panel, a layer of conspicuously flat and thin emotion splayed out in space. By viewing that space and calling up our imagination, we reapply time, movement, and a fuller dimensionality to its surface – in a sense, seeing as the artist might have seen. Only 50 years after Wordsworth’s death in 1850 did film enable and normalize that kind of superlative vision. 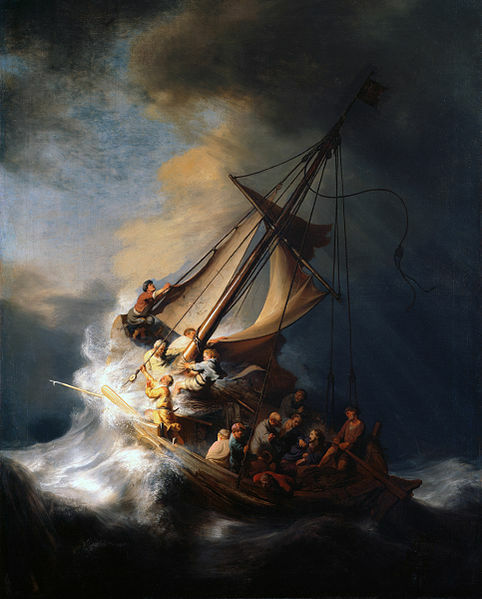 Yet the depth, the colour and, more than anything, the division of light and dark present, for example, in The Storm on the Sea of Galilee (1633) emulate an earlier form of cinematic vision to a powerful degree. Even without knowing the biblical story, the viewer intuitively feels the wind, the spray, the urgency and fear wrought by the storm. The brighter left portion of the composition dazzles the eye, drawing attention to the intense yet perhaps futile labour of the sailors to prevent the boat from capsizing. Moving lower away from the source of light, toward the pure sable depths of the sea, the eye encounters the disciples thronging Jesus, his head encircled with the dim but warm realist suggestion of a classical halo. The parallel illumination of his face, unwrinkled and calm, together with the immediate recognition of his status and place on the jeopardized vessel, instils in the viewer a sense of pacifying beauty, a sense of resolution at odds with the chaotic setting. Hazlitt might have been onto something. A visual precedent for that secularization of Christian experience in Romantic period England resonates powerfully in Rembrandt’s masterful realistic depiction and minute representation of biblical myth and history, literally conjuring up these ancient literary scenes into eternal physical reality. This wasn’t just about religion, but grafting the high drama of religion onto the visually self-evident and commonplace – making the ideal real. Of course, we don’t and may never know if Wordsworth saw this or any other biblical narrative painting by Rembrandt. We may never even know if Wordsworth truly saw any Rembrandt at all or if, when we adjust for the poet’s ego and the unreliability of Hazlitt, all these references simply deflate to the status of a series of misinformed name-drops. But if we choose to believe Hazlitt, and we choose to believe Wordsworth, and we take a brief explorative glimpse at Rembrandt, there are certainly ways in which this slightly stilted, slightly strange comparison begins to glow with a faint truth. Brian Lanahan Miller is currently a first year student in the Literary Studies PhD program at the University of Wisconsin-Madison. His interests revolve around the sociocultural and philosophical relationships between visual art, landscape, and poetry during the long-eighteenth century (1750-1850). This blog post developed out of research conducted during the dissertation stage of an MA in Romantic literature undertaken at the University of Leeds. What is it that distinguishes the Romantic view of the world from others? It is the importance which is placed on individuals who, inspired by the emotive power of imagination, perceive and order the world through their own senses. In doing so they reach an understanding of both nature and themselves. Whether it is manifested in the harmonies of the ‘child in nature’, the solitude in the mountains, or the destructive forces of a sea-storm, it is the Romantics’ feelings towards nature which determines their experience of it. For the Romantic, the role of the artist is always active, never passive. As the German painter Caspar David Friedrich said: “The artist should not only paint what he sees before him, but also what he sees within him. If, however, he sees nothing within him, then he should also omit to paint that which he sees before him.” It is not that the Romantic denies the existence of an independent, objective reality: rather, it is that such reality can only be described through the subjective experience of the individual. Whether grounded in the philosophical arguments of British empiricism or Kantian idealism, the conclusion drawn by the Romantic is the same: the world is only known to us through our imaginative responses to it, and artists, with their heightened receptiveness to feelings, are best placed to reveal it. Such emotions, however, must always be tempered by reason. As the Spanish artist Goya puts it in the subtitle to The Sleep of Reason Produces Monsters (1798), “Fantasy abandoned by reason produces impossible monsters: united with her, she is the mother of the arts and the origins of their marvels”. In seeking to express the world through imagination the Romantics looked beyond the confined and ordered interiors of royal palaces and stately homes towards the wildness and wonder of the landscape. As the German painter Philipp Otto Runge exclaimed in 1802, it is the landscape as “romantic field…..where man and nature dominate equally, each giving meaning and interest to the other”. For it is in contemplation of nature that man achieves his most emotional experiences and profound instances of self-awareness. The empiricist Edmund Burke provided an analysis of (and a vocabulary to describe) this sensation, and the revelation of the ‘sublime’ in his Philosophical Enquiry into the Origin of our Ideas of the Sublime and the Beautiful (1757). Burke’s contribution to the Romantic understanding is his observation that what constitutes the greatest experience of the sublime is that which most disturbs and horrifies us – that which is not within our control or comprehension, but is hidden and beyond us. Further, two attributes of the sublime in nature – vastness and infinity – can only be understood in obscurity. For, Burke says, nothing can obtain to greatness if we can “see an object distinctly” and “perceive its bounds”. As such, “a clear idea is therefore another name for a little idea.” This view is confirmed by Friedrich: “when a landscape is covered in fog, it appears larger more sublime, and heightens the strength of the imagination and excites expectation…..The eye and fantasy feel themselves more attracted to the hazy distance than to that which lies near and distinct before us”. Unsurprisingly, then, we find the vastness and excesses of landscapes and natural disasters (especially shipwrecks) are a common inspiration for Romantic painters such as Friedrich and Turner. It is in this world of space, scale and motion where the artistic imagination is most excited: a world where, as William Hazlitt puts it, objects “hover on the brink of nothingness”. For Philipp Otto Runge (as for Coleridge), this faith in the unspoilt innocence of childhood, where feelings remain spontaneous and unspoilt, was quite literal: Runge was deeply Christian and believed that nature was the manifestation of the Divine, and viewed his painting as communicating the “sensation of our kinship with the whole universe”, where “everything harmonises in one great chord”. 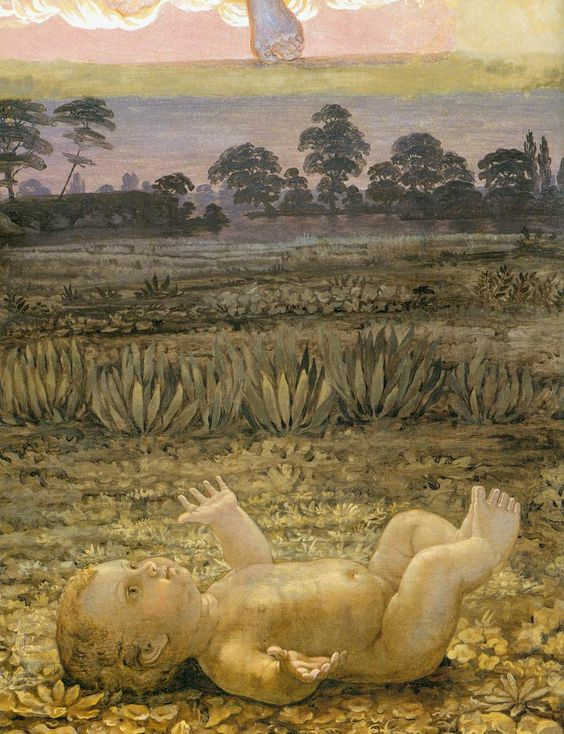 In The Child in the Meadow (1809) Runge has placed a naked infant alone in nature, on its back and staring boldly up to the sky. It is dawn and the child is illuminated in golden, warming light. It looks like Jesus in a Nativity scene, but this it is not a specifically Christian image. Rather, as Tom Lubbock says in Great Works, “it’s a universal symbol of the miracle of birth….a divine baby, taken out of Christian theology, and laid in nature”. As the infant basks in the glow of the morning light, it responds, like a flower, opening its arms in welcome, its fingers stretching up and out like the plants beside it. The baby has apparently sprung from nowhere (or fallen from the sky); and although it is alone it is fearless and at one with nature, emphatically part of its landscape. Mankind and nature are in perfect harmony through the divine miracle of life. We look at The Wanderer Above the Sea of Fog (1818) by Friedrich, and see a man with his back to us, standing alone amidst a mountainous landscape, looking across the foggy vastness below. His stance suggests confidence, or at least defiance in the face of the elements, but we cannot see his face, and are therefore unable to fully gauge his feelings. Is he exhilarated, triumphant and all- conquering, or hesitant, uncertain of his next step into the hazy unknown? We want to be able to analyse his feelings and thereby understand the meaning of the painting, but we cannot do so. So if a total explanation of the Wanderer is impossible, can we at least seek a partial one? We may think that it leaves a contradictory impression, suggesting that man has mastered the landscape whilst remaining insignificant within it. We may be bolder and think that it portrays a single moment of man’s yearning for the infinite, whilst remaining always separate from it. But we cannot know for sure. In The Sea of Ice (1823-4) there is no Ruckenfigur to interrupt our experience of what we see. We are witnessing directly a horrific site in a desolate world. A ship lies amongst the grinding slabs of sea-ice which has, in its relentless and powerful motion, ruined the ship and, presumably, all life on it is lost. The jagged ice-berg in the foreground is mimicked by another in the distance, both mountainous in shape. Are we seeing human aspiration crushed – like the frail bark of the ship – by a glacial indifference’? The impression is that whilst nature can destroy humanity, it remains permanent, and ultimately impenetrable to man. 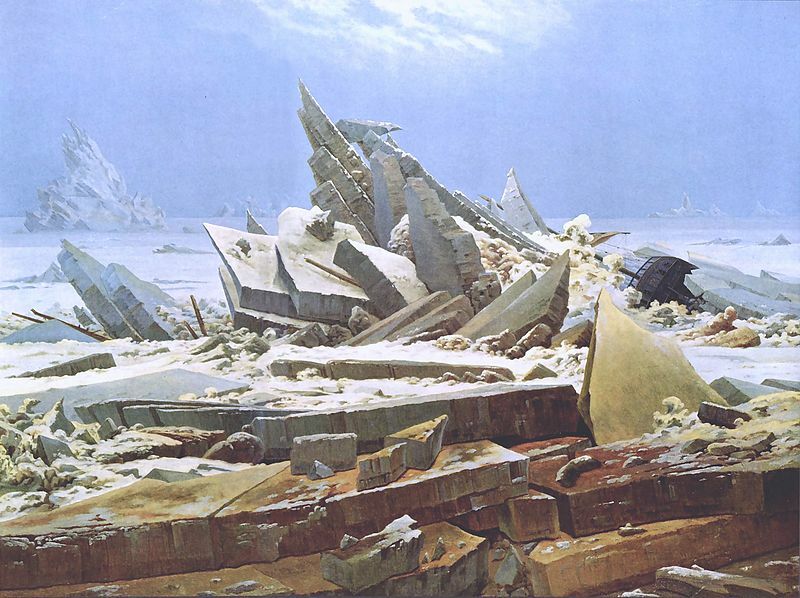 In both the Wanderer and The Sea of Ice Friedrich is showing us an instant of sublimity as we contemplate nature, either directly or indirectly. But in doing so, have we understood, or do we realise that we can never fully understand, the world? That ambiguity is a Romantic achievement, and a Romantic condition of life. We stare, confused, at this chaotic scene: then, refocussing, details rise up and objects become visible. We start to pick out hands flailing in the turbulent waters, see a leg being devoured by monster-fish. The scene remains incomprehensible, but the horror of it has caught up with us. 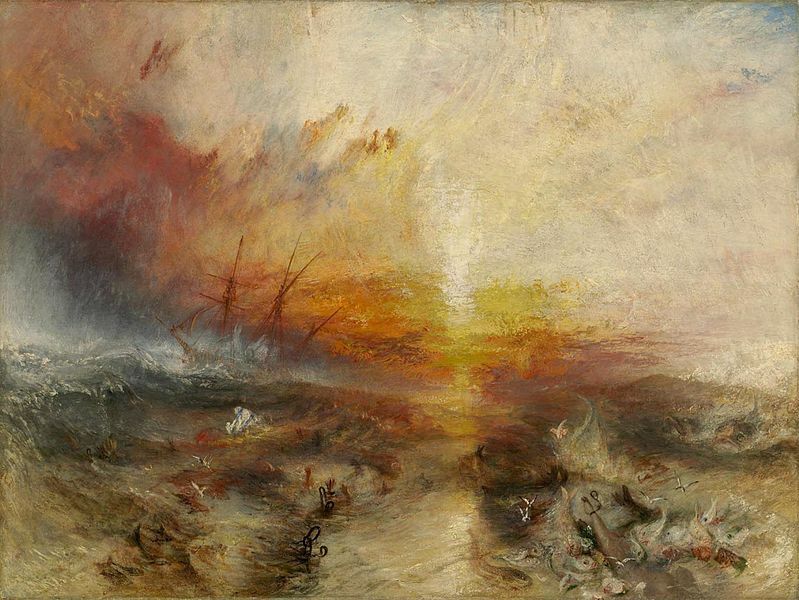 In The Slave Ship (originally entitled Slavers Throwing overboard the Dead and Dying – Typhon coming on) (1840), the English artist J.M.W. Turner depicts the moment in 1783 when the captain of the slave ship Zong had ordered the slaves to be thrown overboard so as to be ‘lost at sea’ and thereby be able to collect for their loss on insurance. Here, the tragic impact of human moral irresponsibility is central to this natural carnage, in that the evil actions of the captain has started the causal sequence of the hellish drama. 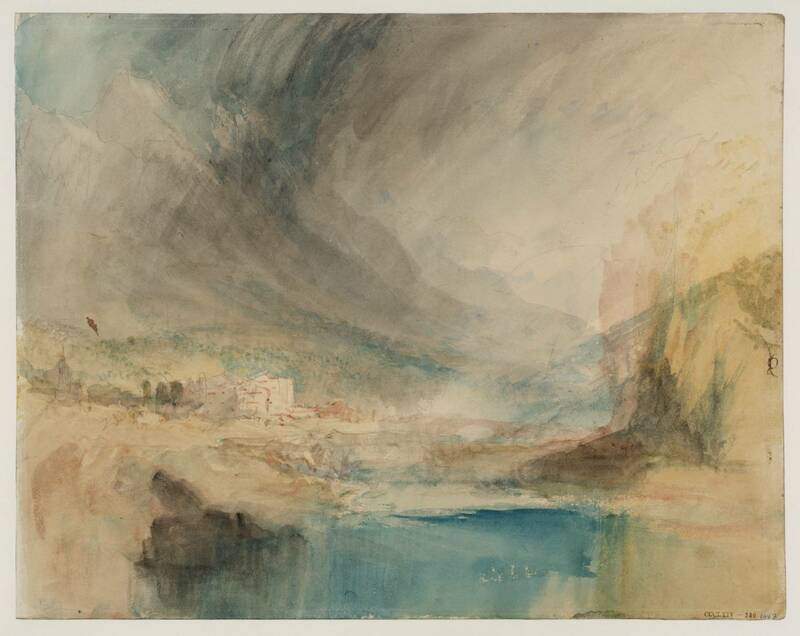 Turner’s use of colour, and the frenzied brushstrokes which deliberately obscure the distinctness of the shapes, enhance the sense of nature overwhelming, and condemning, man. The violent reds and oranges, with the gold of the declining sun, makes the sky angry and sets the sea aflame. As the art critic John Ruskin observed, the ‘fearful hue’ of the sea frames the ‘guilty ship…its thin masts written upon the sky in lines of blood’, tossing helpless in the sea. The painting betrays both a morbidity and an impression of futility. Which rises, flits, expands, and dies. 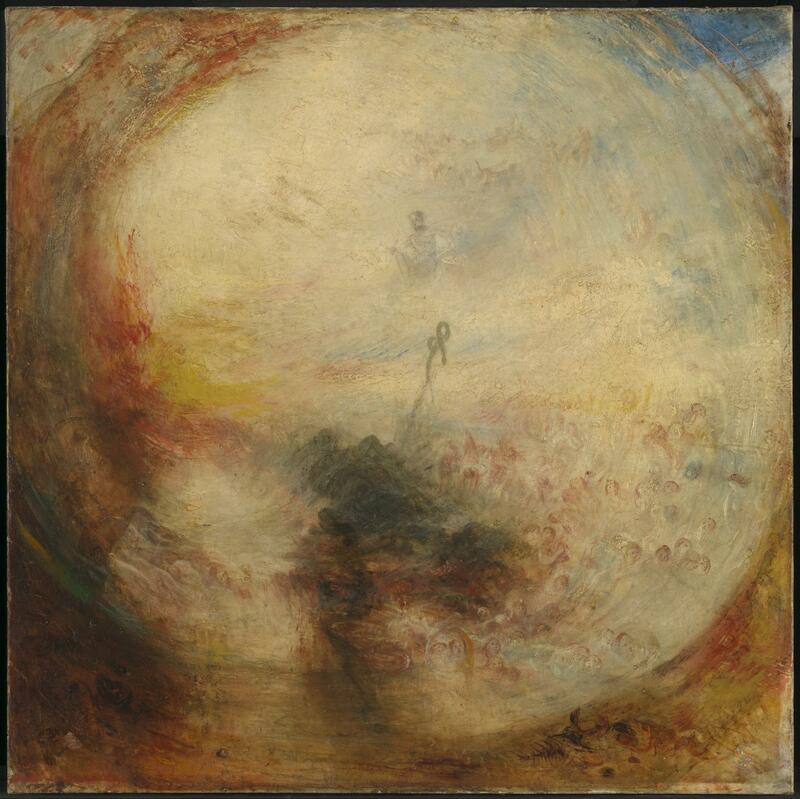 Turner has taken the Romantic landscape beyond the mountains and the seas into a cosmic vision. In doing so he has stretched out the sublime into pure abstraction: a visual impression of the powerlessness and ultimate insignificance of man in an indifferent universe. So where has the imagination of the Romantic painters taken us? Are we living in glorious harmony in God’s earth, as Runge’s ‘child in nature’? Or staring out at the world continually seeking answers, like Friedrich’s wanderer? Or are we resigned, fatalistically, to our own powerlessness in the face of Friedrich’s sea of ice or Turner’s swelling waters? That is the distinctly Romantic dilemma. The miscreant Hazlitt continues, I have heard, his abuse of… myself, in the ‘Examiner’. I hope that you do not associate with the fellow; he is not a proper person to be admitted into respectable society, being the most perverse and malevolent creature that ill-luck has ever thrown in my way. William Wordsworth to Benjamin Robert Haydon: April 7th 1817. In 1811, the portrait painter William Hazlitt divided his time between his London lodgings and his home in the village of Winterslow near Salisbury. Hazlitt and his wife, Sarah, lived in Middleton Cottage, a typical thatched cottage built in ‘chalk cob’. In the summer, when the garden was colourful and the air was scented, the cottage would have been a pleasant retreat for a man used to the unhealthy air and bustling crowds of London. The interior was undoubtedly rustic but there was a fine collection of Claude Lorrain prints on the walls and a workroom containing ‘a bundle of manuscripts, exceedingly abstruse and unintelligible’ as Hazlitt jokingly referred to his print collection and papers. William Hazlitt was 33 years old in that summer of 1811, a slim man with unruly black hair and dark, expressive eyes. He was not engaged in any regular employment so the opinions of his neighbours were divided: some regarded him as a gentleman (his wife’s family had property; her brother was a lawyer who had once been the admiralty advocate of Malta) but others thought him a shabby ‘low fellow’. For his part, Hazlitt attempted to ‘live to himself’, viz., not to be an object of attention or curiosity. He did not mix with the locals and he did not care what anybody thought about his ‘shabby’ appearance. He was in fact painfully shy and awkward in company – Samuel Taylor Coleridge famously described him as ‘brow-hanging, shoe-contemplative, strange’. The villagers of Winterslow would occasionally see their ‘strange’ neighbour sauntering through the local woodlands with a hat on his head, a canvas under his arm, some brushes and paints in a bag and a piece of bread with a boiled egg or a bit of cheese in his pocket. Hazlitt believed that the most sensible men were the painters, that the humblest painter was a true scholar and a student of human nature. The painter, he said, ‘reads men and books with an intuitive eye’. Hazlitt read books voraciously and he studied the great masters – Correggio, Leonardo, Andrea del Sarto – in loving detail. In one case, he said, ‘the colours seemed breathed on the canvas as if by magic.’ Sadly, the very high standards that he set for himself (he aspired to paint like Rembrandt and Titian) eventually overwhelmed him so that his enthusiasm waned and people began commissioning portraits from him not so much for their intrinsic value, but out of little more than friendship. He finally, reluctantly, accepted that he could not earn his living by the brush. Hazlitt was not just a painter, he was an extremely talented writer who had published several volumes including a full-length book of philosophy, The Principles of Human Action. He found, however, after preparing and having rejected a series of essays on the English philosophers, and also a biography of Thomas Holcroft (the dramatist), that his subjects were not popular. He was always in dire financial straits. When a son was born in late 1811, Hazlitt decided to leave Winterslow and take his family back to London, to try and find a way of earning some money. He had several friends in London – Charles Lamb and Henry Crabb Robinson among them – who would offer their support. He thought about the work he had already completed on the English philosophers and decided to give a series of public lectures about them (a brave choice for such a diffident man). After writing to the Russell Institution and asking permission to use their hall in Great Coram Street, he entered its neoclassical edifice in January 1812, mounted the podium and began to deliver the first in a series of talks on the History of English Philosophy. Although the introductory lecture was a disaster (Hazlitt read it too quickly) his technique improved as the series progressed and by the end the lectures were well received. Following this minor success, Hazlitt found that his friends had rallied together and managed to get him a job as a parliamentary reporter. They had worked hard on his behalf, spreading the news that he had once written a book about great parliamentary speeches, The Eloquence of the British Senate. They also pointed out that he had a preternatural memory – he appeared to remember everything he had read and heard so could recount any debate with ease. The strategy met with success and Hazlitt was offered a job on the Morning Chronicle that came with an extremely generous salary of £220 a year. Within two years, William Hazlitt became a public figure. He became a journalist at the Examiner newspaper and the author of a popular book of essays, The Round Table, and the very successful Characters of Shakespeare’s Plays. Knowles stopped to open his basket and show us the success of his sport. Hazlitt, drawing his breath, peeped timidly in, and was as nervous as if he were looking into a cradle containing dead infants. As Knowles took one of the fish in his hand, expatiating upon its merits when cooked, and on the table, etc., Hazlitt, sighing, exclaimed, ‘How silvery! What rainbow hues and tints glisten and flit across its shining surface! How beautiful! Do you remember Waller? Hazlitt continued quoting whole passages of poetry about fish, said Bewick, until Knowles, caught up in the spirit of the thing, literally burst into song. [Shakespeare] was just like any other man, but that he was like all other men. He was the least of an egotist that it was possible to be. He was nothing in himself; but he was all that others were, or that they could become. …all the persons concerned must have been present in the poet’s imagination, as at a kind of rehearsal… The poet may be said, for the time, to identify himself with the character he wishes to represent, and to pass from one to another, like the same soul successively animating different bodies. Colin Silver lived for many years near the Lake District. He developed a deep interest in the life and work of the great 19th century art critic John Ruskin whose house overlooked Coniston Water. Following Ruskin, Colin developed a love of the work of the Pre-Raphaelites and the Romantics, particularly Keats and Shelley. When he moved to Oxfordshire, Colin continued his studies and began writing articles on a freelance basis for the Oxford Times’ Limited Edition magazine. His subjects included Keats, Shelley, Ruskin, the Pre-Raphaelites, Shakespeare and the celebrated 19th century physician Henry Acland. His first book, John Keats and Benjamin Robert Haydon: The Pursuit of Beauty of Truth is now available from Amazon.